We've seen ereaders repurposed as weather stations, a netbook, and even a project status board, and now one has made its way to your refrigerator. Last week a hacker by the name of Peter Vojtek published the details of his latest project. He took a Kindle 4 and a Raspberry Pi and turned them into the DIY equivalent of a Vikaura E-ink picture frame. The Kindle is on the same Wifi network, and has been set to watch that same webpage. When a new image is loaded, the Kindle refreshes the browser and displays the image on screen. 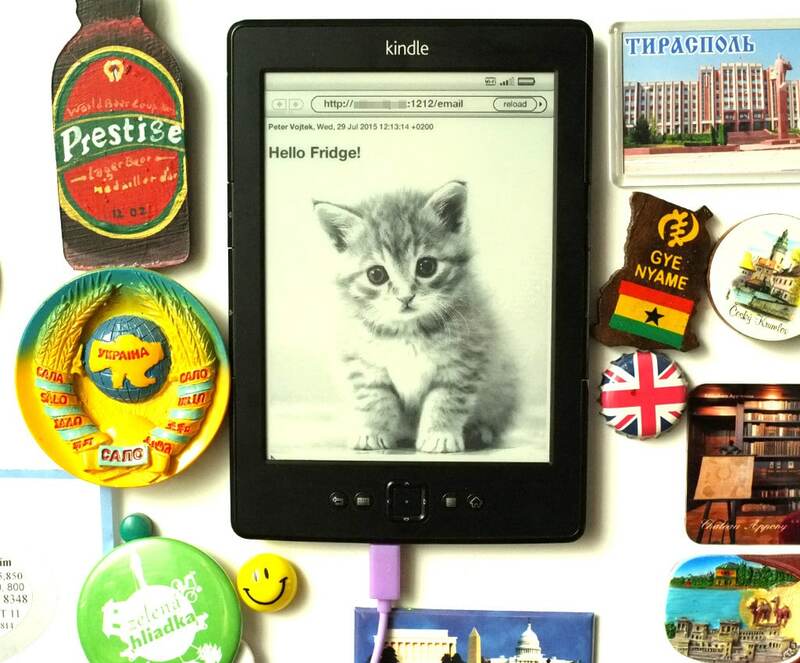 That's a neat way to send secret messages, and if you disable the Kindle's screensaver and add a sticky magnet to the rear of the Kindle, you have the ultimate geek's fridge magnet. P.S. Coincidentally, both the project itself and the project website are hosted on Github. It looks like Vojtek is using HubPress or another platform to host his blog on a repository for software projects. Hey, this looks like fun! It uses Ruby instead of Python or PHP, so it’s a chance to ease into a new language. The instructions are easy and clear, and my guess is that there are a fair number of used Kindles floating around for cheap that could be used as a basis for this project. You don’t necessarily need to use a Raspi, but it’s plenty powerful enough. Plus, if it gets hacked, you just wipe the sd card and start over. Having a single-purpose computer makes recovery so much easier.